Here is a photograph of medium grain brown ballast on a section of the test track. 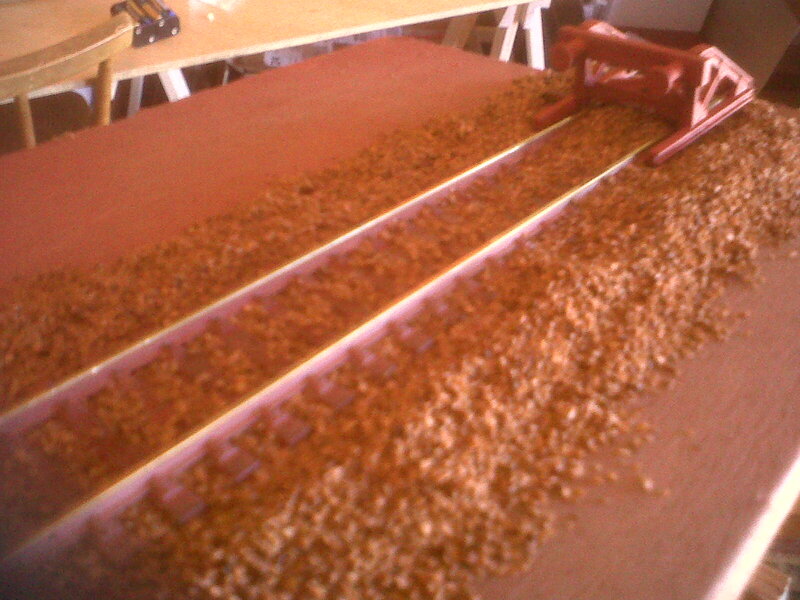 Despite what most enthusiasts say, I think this grade of grain looks more realistic than the fine grain ballast. Not sure about the colour, though. 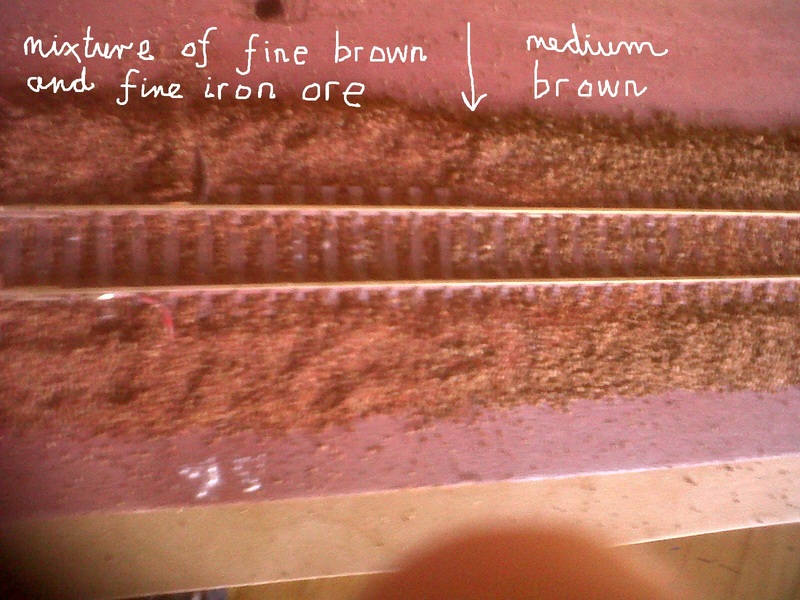 So, continuing the experiment with the various packets of ballast I purchased last week, I mixed some fine grain rust coloured (iron ore) ballast with fine grain brown ballast in the hope that the latter might tone down the very red rust grains. Mixing was easy but the end result looked a bit "salt and peppery" to my eye. Nevertheless, I ballasted a short section of track abutting the section with the medium grain for comparison purposes. 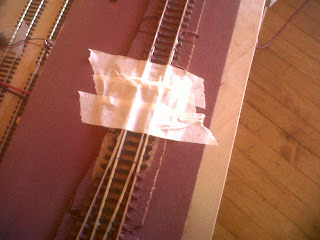 Since, the set of points was hoving into view, I first covered its mechanism with masking tape to stop any wee grains fouling its innards. I used an empty kitchen spray to soak the ballast with water prior to the PVA glue being applied - see earlier blog from last week for a description of this process. 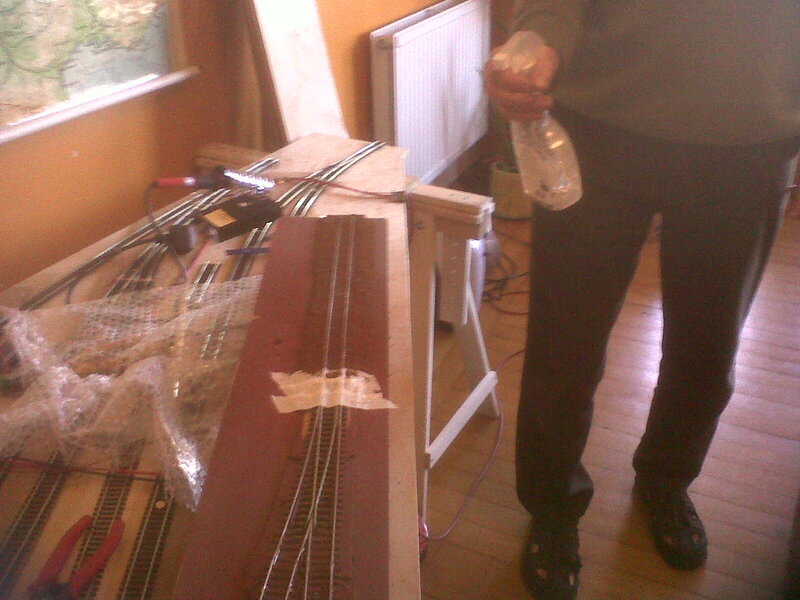 By the way, I poured the ballast direct from the packet - didn't bother using a pouring container: worked fine. And below is the end result seen next to the medium grain brown section. There is not a huge difference and so I've demarcated the two sections with a white arrow. 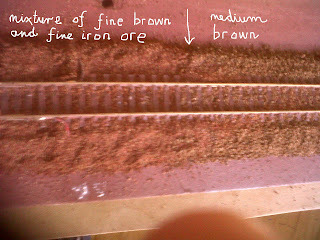 I actually like the larger grain of medium vs fine and so will order from internet today a packet of medium grain iron ore ballast - I'm still minded to adopt the red finish of iron ore for the final layout. (1915 – 1997) was a Soviet pianist widely considered one of the greatest pianists of the 20th century. Downloaded from iTunes today two short Chopin Etudes played by Richter which I'd heard played on Radio 3 this morning. The Etudes were from Chopin's Op 25 set of 12, namely, 11 and 12 and were absolutely explosive. I'm used to Boris Berezovsky playing them and wondered how the two pianists differed in their approach. The answer lies in the word "explosive". Two quotes by Richter from Wikipedia article. On listening to Bach: "It does no harm to listen to Bach from time to time, even if only from a hygienic standpoint." On Scriabin: "Scriabin isn't the sort of composer whom you'd regard as your daily bread, but is a heavy liqueur on which you can get drunk periodically, a poetical drug, a crystal that's easily broken."